You often see books on theoretical approaches and new interventions in therapy, but you rarely, if ever, find a book where therapists discuss their personal reactions to and views of the therapy they offer. 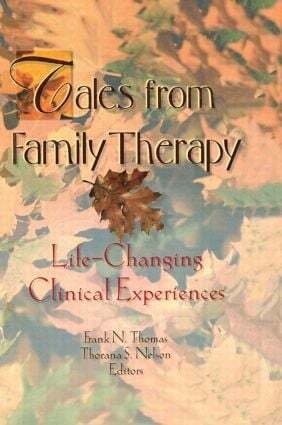 In this amazing volume, Tales from Family Therapy: Life-Changing Clinical Experiences, psychologists, psychotherapists, and marriage and family counselors come together to share their unique experiences in therapy sessions and how they’ve learned that often the clients know more than they do! As you will see, and as these therapists reveal, sometimes all the top-notch and most innovative theories in the world won’t help a client in distress. In the therapy room anything can happen, and as Tales from Family Therapy shows, anything does. Graduate students, counselors, licensed therapists, family educators, and family sciences professionals, as well as lay readers, will find this insightful book a helpful forum where the struggles, doubts, and triumphs of psychotherapy are revealed to encourage and inspire those who participate in the therapeutic process.